Did you know that today is National Lasagna Day? I have three yummy lasagna recipes to share with you from Dei Fratelli, as well as some great ones from great bloggers. 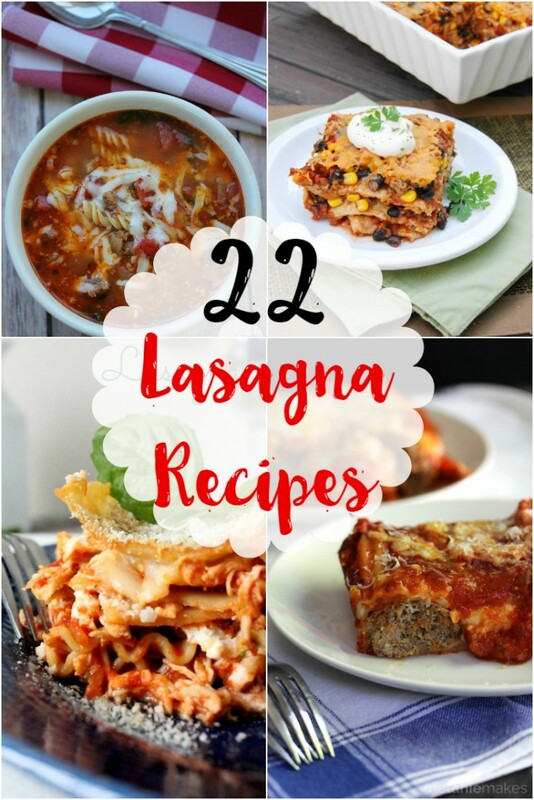 There is sure to be a lasagna recipe here that you will love! Traditional Lasagna – This recipe is a classic and exactly what you would imagine when you think of lasagna. The Dei Fratelli crushed tomatoes and tomato sauce ensure your lasagna will be packed with flavor! Vegetable Lasagna – This is a great recipe for vegetarians who still enjoy a good, hearty lasagna! It’s got that classic lasagna flavor with Dei Fratelli tomatoes but with a veggie twist. Zesty Italian Slow Cooker Lasagna – Maybe your busy schedule prevents you from making a traditional lasagna, but that doesn’t mean you have to miss out. This slow cooker recipe includes all your favorites while allowing you to step away for a while. Which lasagna recipe are you most excited to try out? Thanks so much for including our King Ranch Chicken Casserole, aka Mexican Lasagna, in your round-up! I hope your followers enjoy it as much as my family does. I just love lasagna, and there are so many fabulous choices here! Can’t wait to go looking at them all! Pinning. Thanks for including our Easiest Lasagna Ever! We looove lasagna. I will be trying some of these. Thanks for including my Chicken Parm Lasagna! Lasagna is my fav! I love making it all different ways so I’m thrilled to see so many recipes, including veggie lasagnas – and even cupcakes – wow! Oh wow! I am in lasagne heaven.Thank you!! This is so cool, now I can try other lasagna recipes. I have my own lasagna recipe that I make from scratch, it’s awesome, my kids love it. Now I’m definitely gonna try some of these, and see what the kids think. This look so good. Thanks for another great post. Thank you for all the different recipes of Lasagna. We love Lasagna here. And so many different kinds to make. My family loves lasagna. Thank you for the recipes. This is a fantastic recipe for the whole winter months. I am making this tomorrow. I thank you for the delicious recipe.